SEASSI is an eight-week intensive language training program for undergraduates, graduate students and professionals. It has been held since 1983 and hosted by UW-Madison in 1994-1995 and then since 2000. 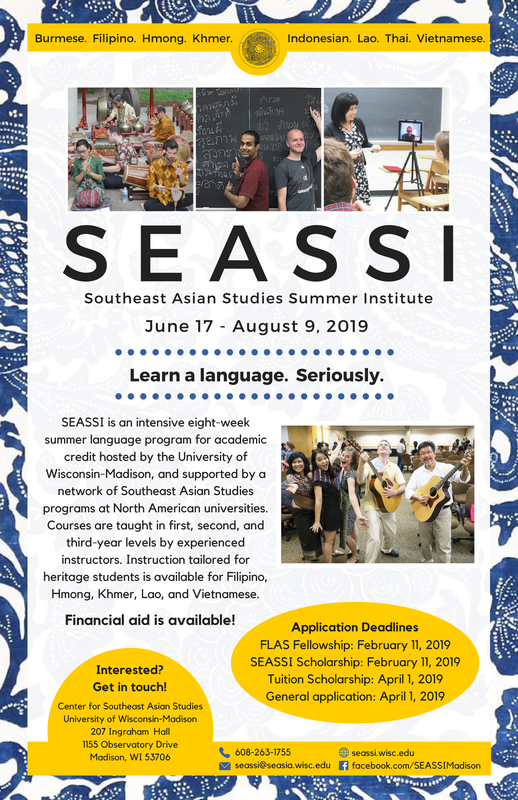 Instruction is offered for academic credit in Southeast Asian languages (i.e., Burmese, Filipino, Hmong, Indonesian, Khmer, Lao, Thai, and Vietnamese) at the 1st, 2nd, and 3rd year levels. SEASSI is an integral part of a nationwide network of language teaching faculty from institutions that are members of the SEASSI Consortium, which comprise Cornell University, Michigan State University, Northern Illinois University, Ohio University, University of California-Berkeley, University of California-Los Angeles, University of Hawaii-Manoa, University of Michigan, University of Notre Dame, University of Washington, and University of Wisconsin-Madison. Representatives from these institutions meet annually to discuss SEASSI, and all major decisions regarding the institute must be approved by the SEASSI Board. For more information, visit the SEASSI website here.